Sanilac County was a solid Republican stronghold when I was reporting there. I think it still is. In 1974, during the heat of the Watergate Scandal, President Richard M. Nixon came to our town under strange and unexpected circumstances and I was there when it happened. It may have been Nixon’s last public appearance before his resignation in August that same year. The political set-up for the presidential visit began when Nixon appointed Republican Congressman James Harvey from the Thumb’s Eight’s District to fill a federal judicial vacancy on the Bay City District Court. And in the early spring of 1974, the vacancy created a hotly contested race in a special election between Harvey’s chief aide, James Sparling, and a Democratic Candidate, Michigan Representative Bob Traxler. The election was set for April 16. President Nixon felt so strongly about the party regaining that Congressional seat that he decided to stump for Jim Harvey in the Thumb District. His press corps announced a tour that would begin at Bad Axe, the Huron County seat, then move south into Cass City in Tuscola County, then southwest into Sandusky, the Sanilac County Seat. It was such a rural farming area that people had a hard time believing that Nixon would really come to the area. But when Secret Service agents began showing up in the various towns along the route and checking buildings, we knew it must be true. The editorial staff at my newspaper in Port Huron began holding special meetings to plan how we would cover such a major event. I was going to have the heavy assignment of accompanying the president on the tour from Bad Axe into Sandusky. Ralph Polovich, our chief photographer was assigned to intercept the caravan at various points, with most of the photo work to be done at Bad Axe and Sandusky. Other reporters were covering the crowds along the route, getting that perspective. All reporters and staffers expecting to get anywhere near the president had to take a trip to the federal building in Saginaw to be fingerprinted, photographed, and run through an FBI screening process. We had never seen anything so thorough and so elaborate. I was assigned to a caravan of press buses that would follow the presidential motorcade. I was given a ride to Bad Axe and was expected to ride in the motorcade back to Sandusky. Other area reporters who had gone through the same screening were waiting there with me. We all went out to the airport because we knew the president was going to arrive on a helicopter. 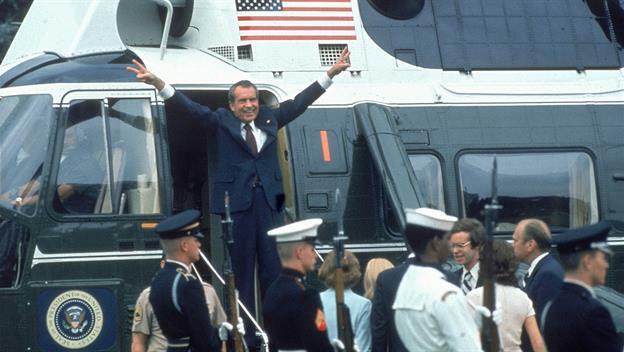 But as his helicopter was approaching the Secret Service was there to whisk us all off the grounds and send us back to the courthouse grounds, where Mr. Nixon was to make his first appearance. That was where I got my first glimpse of President Nixon. He looked exactly like he did on the nightly television news, and in all of the press photographs. I had a hard time squeezing through the crowd of television, radio and other media types just to get close enough to hear anything Nixon said. What he said was the usual rhetoric that all politicians deliver. There was nothing worth writing down. Just being there was the most important thing. He didn’t stay long. After a few words Nixon jumped in his nearby waiting limousine and the motorcade started off. All of the members of the media were left scampering for their buses to follow. My bus was about the fifth or sixth back from the front so it was a wild run for me. From Bad Axe the motorcade turned south on Highway 51, then turned west into Cass City where the president made a second stop. It was another wild dash to where ever he was saying a few words, then running back to get on the bus. This time I picked the wrong bus and found myself traveling with the elite Washington Press Corp. There I was, packed in there with Tom Brokaw, Dan Rather and a number of other well known television news personalities of the day. I remember Brokaw and Rather because they both went on to be network anchors. Brokaw was in the seat ahead of me. The reporters in that bus naturally were curious as to just who I was and why I was on their bus. When I explained that I had accidentally boarded the wrong bus they all had a good laugh. I rode with them all the way from Cass City down miles of country roads right into Sandusky. Thinking back on it, I think I was more enamored by these great names in the media, and being seated as I was among them, than I was seeing and hearing Nixon. Nixon was living in such disgrace in those days that he wasn’t well liked. That is from a national perspective. He was obviously still popular in the Thumb. He was well received among those farming folk. They were Republicans right to the core. I remember Brokaw being much shorter than I had perceived him. And he was a jokester. He kept us all entertained, laughing about how the cows were all lined up along the road to welcome Nixon. All of the Washington press reporters expressed surprise and confusion as to why Nixon would come to such a remote area. I had the distinct feeling that some of these people had never seen cows, ducks, chickens and wheat growing in the fields. Things got lively when we reached Sandusky. That city was packed with people who came from miles around to get a glimpse of the president. Also the police captured a suspicious man with a gun in his pocket, and that stirred some media frenzy. Nixon gave his longest speech from the courthouse lawn. Then he was whisked off to the airport where he flew off in his waiting helicopter. I suspect Airforce One was waiting for him at Detroit Metro or possibly at a U.S. Air Base north of Detroit. And that was it, at least for most folks. Everybody disbursed and went home for the day. My job was just beginning. I drove to Port Huron where I kept an appointment to interview Jim Sparling. It was a tough interview because my editors sat in on the interview with me, so the heat was on. After a long and highly charged day, I had to be sharp and fire tough questions. Then I was in the news room, writing the Sparling story and the story of Nixon’s tour. I left the building sometime after midnight and drove the 50-mile trip back home in Sandusky. I don’t remember ever being as mentally exhausted as I was after that ordeal. I have wondered since how the reporters in Washington keep up that kind of a pace every working day. Sparling lost the election to Traxler. As far as I know, this tour may have been the last public tour by Nixon before he resigned under threat of impeachment.